Camp Lejeune prides itself as the home of the Montford Point Marines, the Corps’ first black enlistees, and the first large unit of female Marines, known as the Marine Corps Women’s Reserve. The first female Marines, 305 in number, enlisted in 1918, when the Navy Secretary allowed women to enroll for clerical duty (they were discharged in 1919). The Army, Navy, and Coast Guard all accepted female recruits in the early years of World War II, but the Marine Corps was reluctant to do so. However, faced with significant losses in the Guadalcanal offensive in the summer of 1942, Marine Corps senior officers realized it was necessary in order to free up as many male Marines as possible for combat. Thus, the Women’s Reserve was formed by amendment in 1942 to the U.S. Naval Reserve Act of 1938. The first women enlisted on February 13, 1943 and, as with African American Marines, Camp Lejeune, the Corps’ largest east coast base, was chosen as the training center. That summer construction was completed on the Women’s Reserve cantonment area, consisting of several barracks, mess halls, and other support facilities. Unlike other branches, the Marine Corps did not drastically relax its training regimen or admissions policies for females. About 3,000 women trained elsewhere while facilities were being prepared at Camp Lejeune. The base remained the primary source of female Marines during World War II. Over the course of the war, 23,145 women enlisted and 965 held commissions. By the war’s end, 17,672 women who trained at Camp Lejeune were on duty, including Eugenia Lejeune, daughter of the general for whom the base is named. Enlistees were inducted into specialties ranging from cooks and clerks to transport personnel and mechanics. One-third of the women served in aviation-related fields, particularly at Cherry Point. More female Marines were inducted than African American Marines during World War II. Female Marines lived up to their motto “Free a Marine to Fight,” and were credited with the formation in 1944 of the 6th Marine Division, which spearheaded the attack on Okinawa. Without the women’s contribution in filling non-combat roles, the manpower would not have been available to form the division. After the war, the female Marines, considered expendable like their African American counterparts, were scheduled for elimination. The women’s schools were disbanded in September 1945 and the entire reserve was discharged on March 13, 1946. However, the Women’s Armed Forces Integration Act of June 12, 1948, reestablished the presence of women on active duty and females were once again inducted into the Corps. After 1948, however, all women’s training took place at Parris Island, South Carolina. Meid, Pat. The Marine Corps Women’s Reserve in World War II (1968). Kimball, L. J. Semper Fidelis: Brief History of Onslow County and Marine Corps Base Camp Lejeune (2006). Simmons, Edwin H. The United States Marines: A History (1998). Soderbergh, P. A. Women Marines: The World War II Era (1992). Stremlow, Mary V. Free a Marine to Fight (1994). Borlik, Alicia K., Staff Sgt. USA. "DoD Marks 50th Year of Military Women's Integration." June 17, 1998. American Forces Press Service. http://archive.defense.gov/news/newsarticle.aspx?id=41380 (accessed April 8, 2015). "The Women's Armed Services Integration Act of 1948." The Women's Memorial Online Collections, Roy Roseznweig Center for History and New Media. http://chnm.gmu.edu/courses/rr/s01/cw/students/leeann/archresreshistkwintact.htm (accessed April 8, 2015). "Major Moments in Women's Military Service." Fact Sheet 2011, Service Womens Action Network, https://www.pritzkermilitary.org/files/7014/4120/5456/Major-Moments-Fact... (accessed April 8, 2015). Devilbiss, M.C. Women and Military Service: A History, Analysis, and Overview of Key Issues. Air University Press, November 1990. http://www.dtic.mil/dtic/tr/fulltext/u2/a229958.pdf (accessed April 8, 2015). 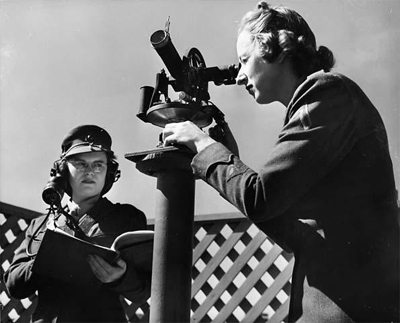 Two Women Marines working with weather instruments at Cherry Point, N.C. Photograph, ca. 1941-1945. Item H.1947.44.1.300, from the collections of the North Carolina Museum of History. Semper Fi Marines! Just touching base with you and letting you know my mother is still doing well at the age of 105 as of January 30, 2019. Her name is Dorothy Schmidt Cole and was with the first women to enlist. She is still a member of the Marine Corps League in Cabarrus County NC Detachment #1175. Semper Fi Marines! Just for the records, My mother D. M. Schmidt is now 104 as of April 30, 2018 and will be 105 in Sept, 2018. She is doing great for that age and still has a good sharp mind too. Hope she is the oldest at this time, but need confirmation. Thank You! We are located in N.C.
My mother-in-law, Lillian Halaberda was a women Marine from 1944- 1946, she is 93 1/2. She was wondering where she stands in the list of oldest living women marines. If you could help us with this information, it would be appreciated. Lillian talks fondly of her marine days. Today she is under going surgery for a repair for her fractured left hip. She is very healthy. She takes no perscription medication, only a multi vitiam. Very coherent and active. Our oldest living Marines are currently 102 and live in Fl. We have 11 who are 100 and above. The Women Marines Association: https://www.womenmarines.org/wm-history. They may have a list that has been compiled or may be able to direct you to an organization or resource that might help. I hope this helps! Please let me know if we can help with anything else. My mother was a Marine who first went to The New River Training Station in July of 1944. I am looking for a class photo or such. She was married to Alfred Thomas Berto, also a Marine. Her name was Carmel Sabin Berto. Any information on her would be greatly appreciated. She stayed a Marine untill 1953. I am forwarding your question to Reference Services at the NC Government and Heritage Library. A librarian will contact you shortly to help suggest resources to look at if you are still looking for information.